Think summer time, think 4th of July, think Memorial Day, think Labor Day, think back-to-school, think teacher appreciation day. I can come up with countless reasons to make apple pies and countless recipes to try. These mini apple pies happen to be my fave. Probably because of the streusel topping (because who doesn’t need a second helping of brown sugar and butter?) but also because they are so darn cute! Not to mention – bite size always seems to make serving and eating oh-so-easy. This is the second time you’re seeing these cuties on this here blog. I originally debuted them in C is for Carnival for sweet Baby C’s baby shower. This go around, it was for book club. The book was A Night Circus which focuses on a magical traveling circus. – I can’t wait for the movie to come out…I know, I know…books are always better but this makes the imagination go bonkers and will make for a breathtaking movie. 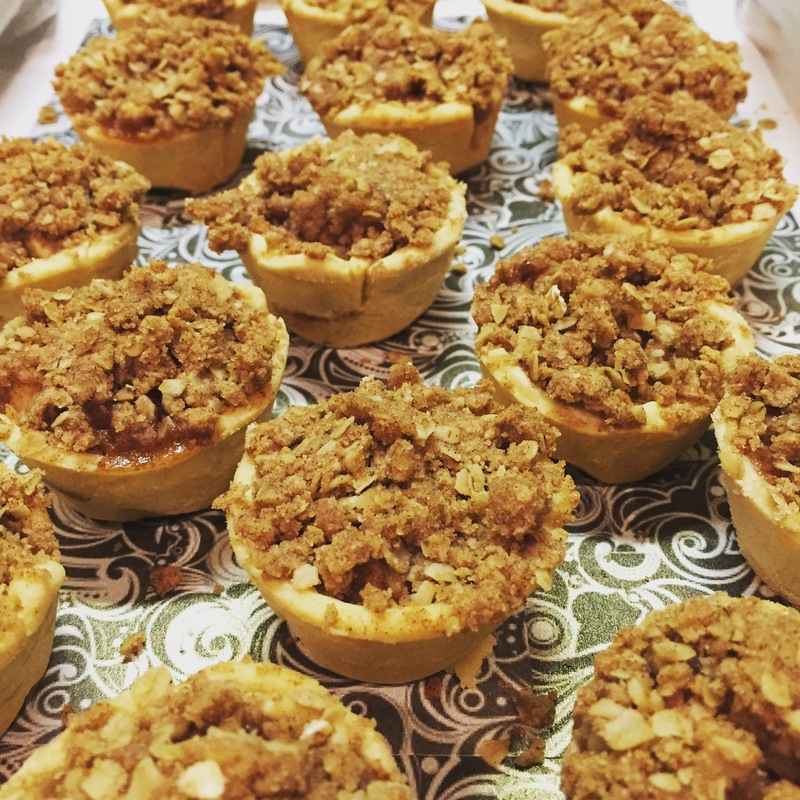 – These mini apple pies both fit the circus theme and seemed to be a hit with the ladies. I’ll take their word for it as I was halfway through my Whole30 challenge at the time and these definitely are NOT compliant! Here’s what you’ll need to get started (complete recipe at the bottom). 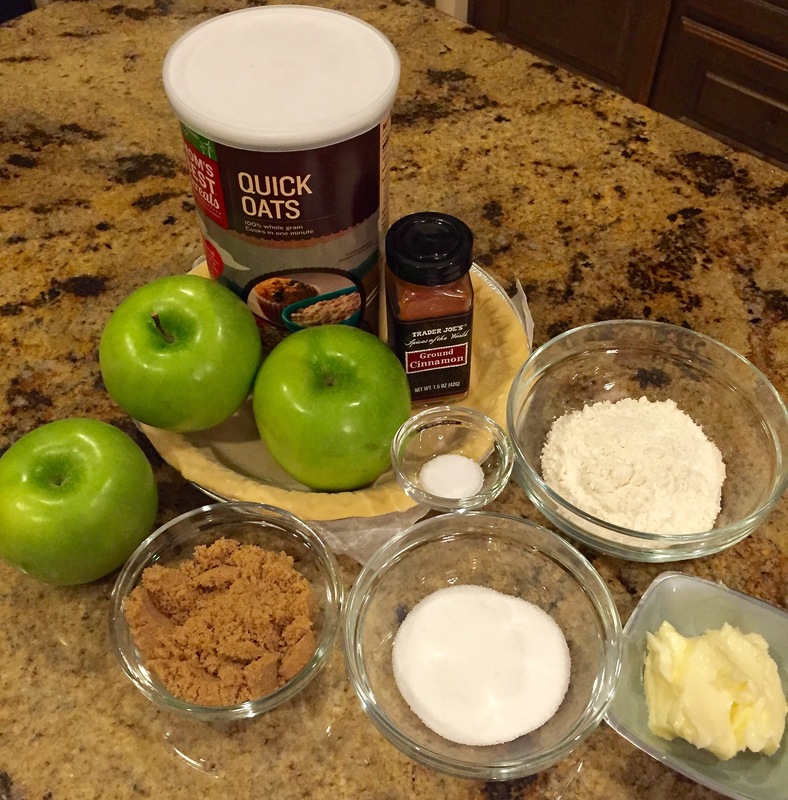 Basically all the yummy things your baking cabinet has to offer – brown sugar, cinnamon, oatmeal, pie crust, BUTTER 🙂 NOTE: I find it best to use green apples – they seem to hold up better in baking and keep more of their flavor. Before you get started, let’s talk pie crust. 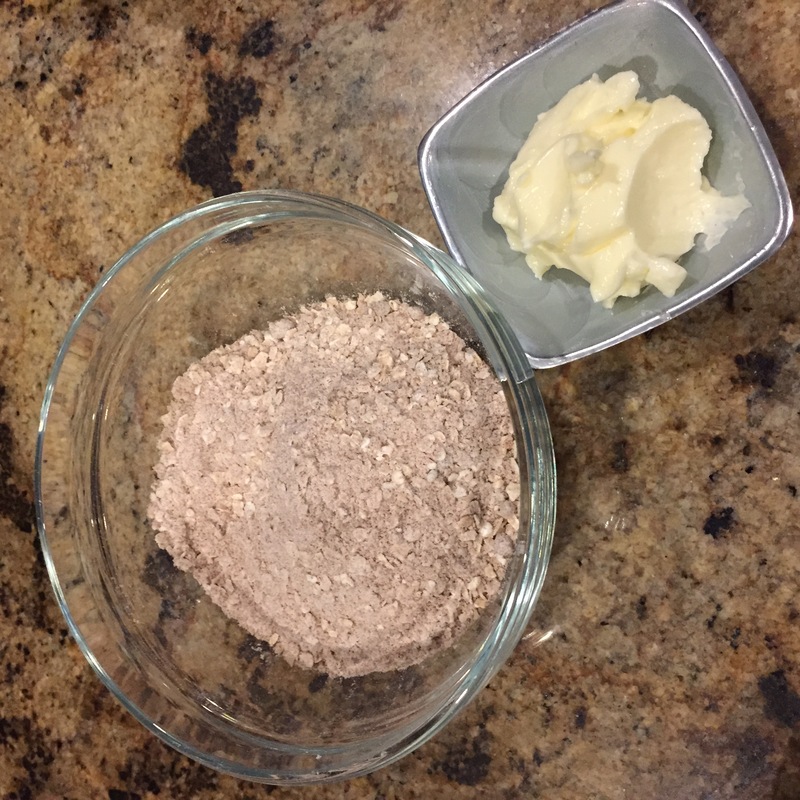 If you want to be super Betty Crocker today and make your own pie crust – I will not stop you. I will say, every time I’ve made these I have had no shame in buying store-bought crusts and had great success. If you’re buying store-bought, be sure NOT to get the deep dish, you’ll find out why later on. Just get the regular size set of two. Be sure to transfer your pie crust from the freezer to your fridge before you get to work on the rest of your prep so it’ll have time to thaw a bit. Now, let’s get to baking! 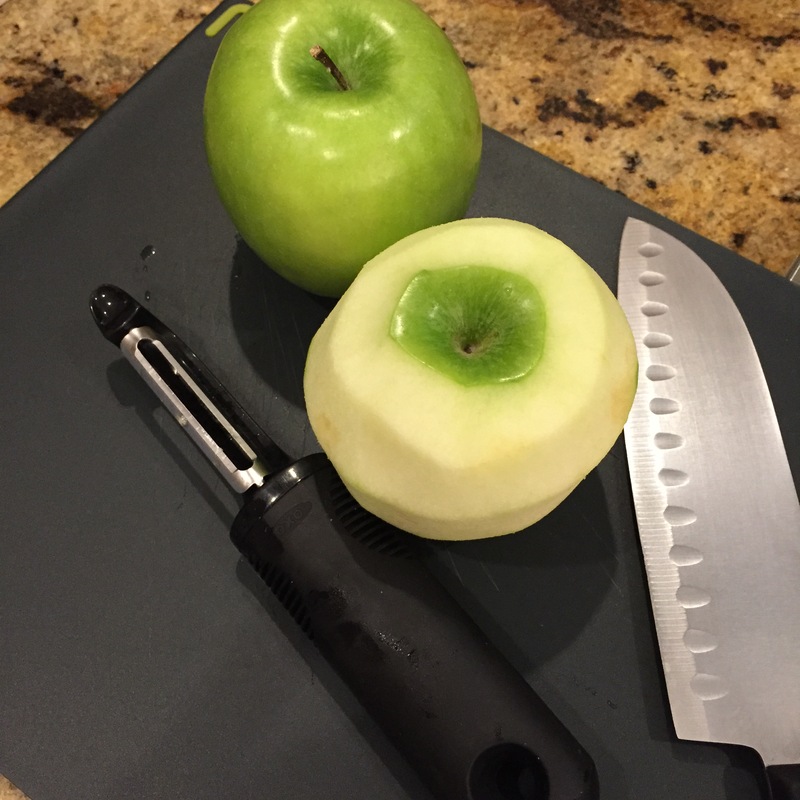 To get the apples ready I find it easiest to use a potato peeler to get the skins off but if you have a favorite way your momma taught you have at it! Then you’ll want to chop the apple into tiny pieces – the smaller the better to me since we’ll be stuffing these into mini muffin tins. 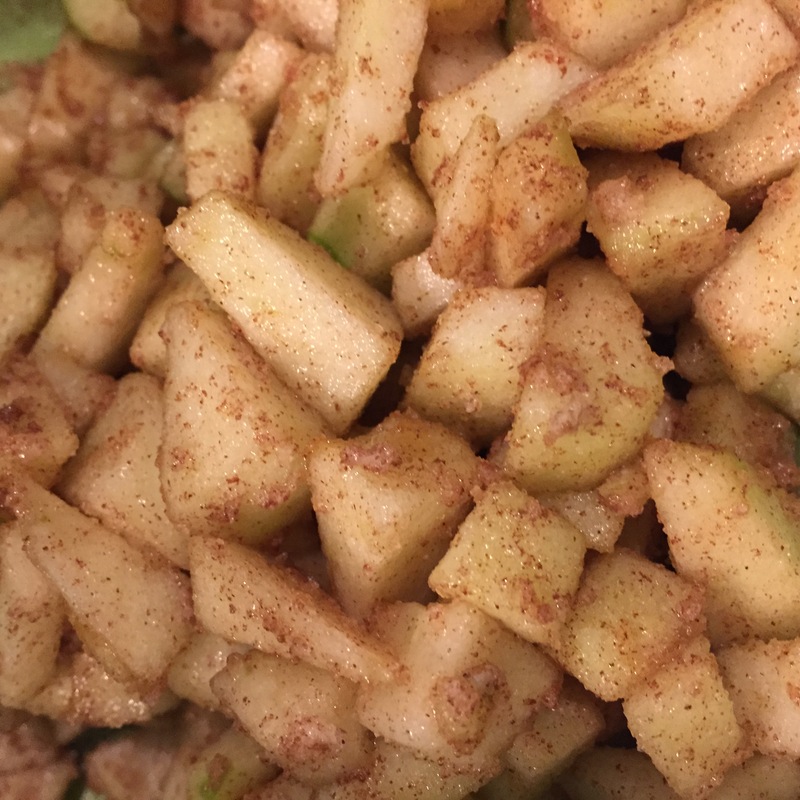 Once the apples are cut (I did two green apples for 24 pies), throw them into a bowl and mix with just 1/2tsp of your cinnamon, sugar (white stuff, save the brown for the streusel! ), salt and 1tbsp of the butter. And can we just take a moment to enjoy the sweet goodness of simple apples and cinnamon? So pretty and so scrumptious! 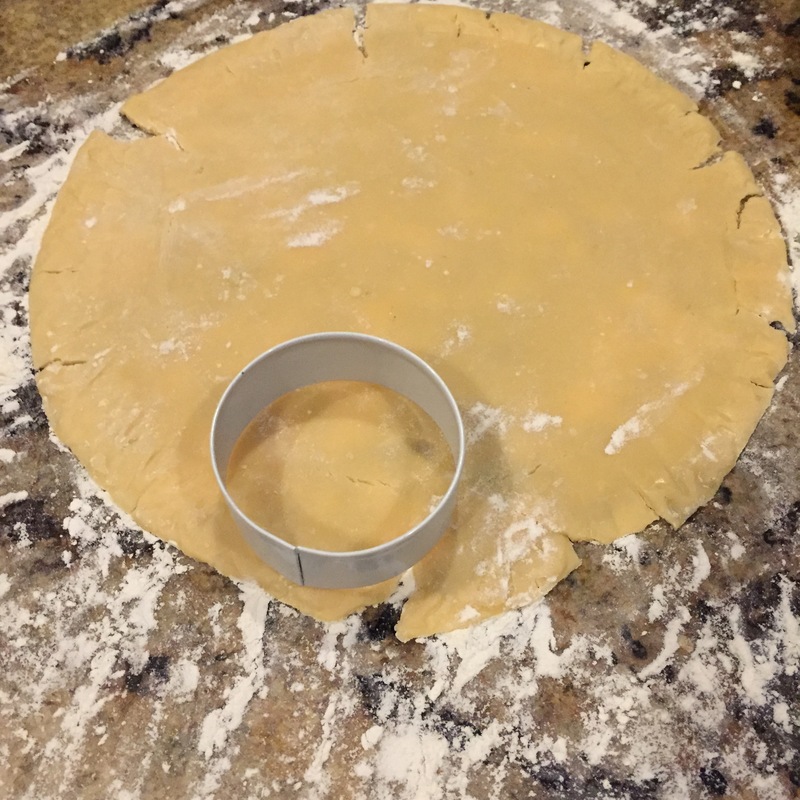 After you’ve indulged and washed up, get your counter and muffin tin prepped with flour and grab that rolling-pin and circle cookie cutter (I used a 2 1/2″ round). On the store-bought pie crusts, because they come already in the tins they will split a little around the edges as you turn them out – thus why I prefer to not use the deep dish versions. Don’t worry, there is plenty of dough to rework with your rolling-pin as you go along. Go ahead and roll them out a bit to get them nice and thin (they are going in mini muffin tins after all) before cutting. Be very gentle as you lower these into their pods, slightly folding the edges a bit to fit them in. I know, the cuteness factor is starting to show itself isn’t it? Once you’ve lined them all, or as many as your pie crust will allow, take your apples out of hiding and get to filling! 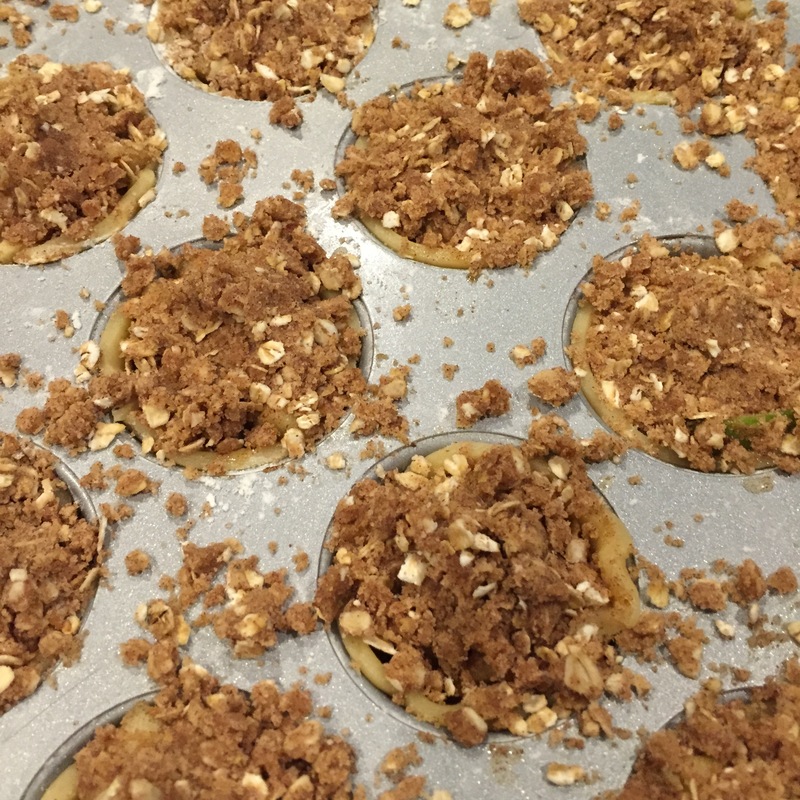 I’ve learned that I prefer to stack the apples up to the top with a litter sprinkling of streusel. But, if you like a half and half mixture, feel free to fill them a little less to allow more room for your topping. 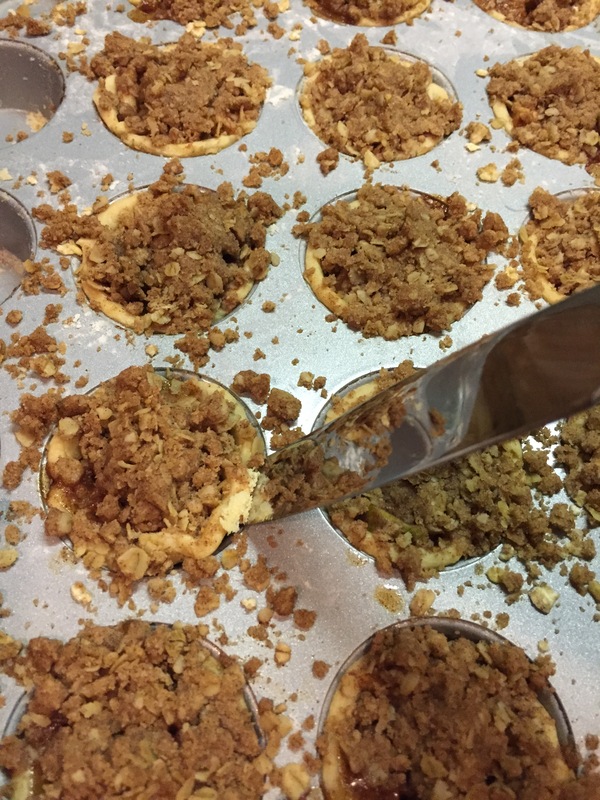 All that’s left to do is finish these off with their streusel topping! Go ahead and smoosh some on top of these as well as sprinkle. It’s ok if it gets messy…I mean check mine out. Pop these cuties into the oven at 375 for about 23 mins. Let them cool for about 10 mins and then very gently take a knife to help pop them out. Serve warm with ice cream or cool – they’re delicious either way. Preheat oven to 325 degrees and move pie crust fridge to thaw. 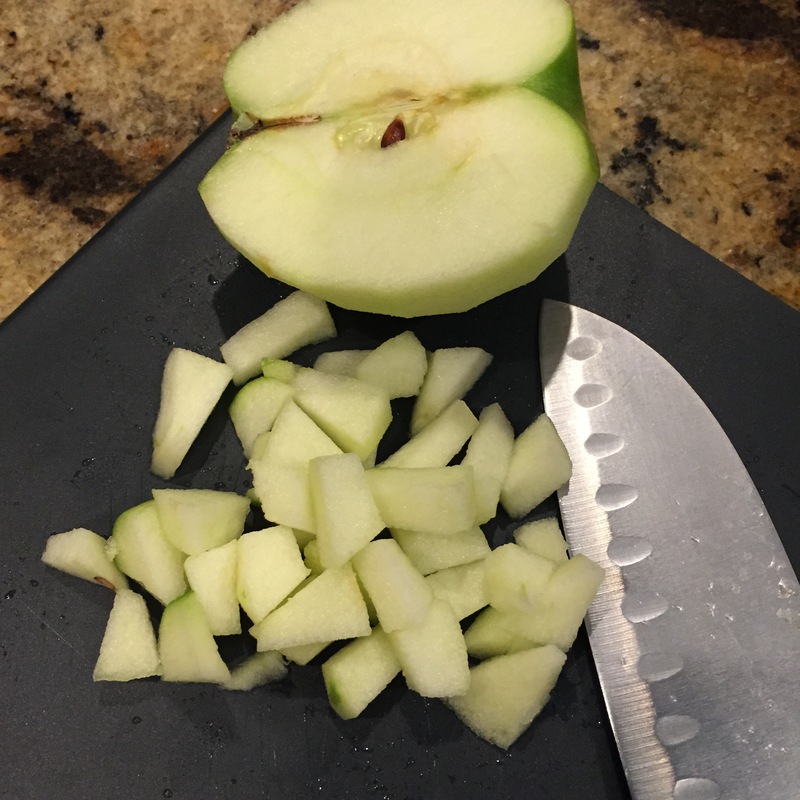 Peel and chop apples into tiny bits (see picture above). Toss in a mixing bowl with ¼ cup granulated sugar, ½ tsp. cinnamon, 1 tbsp. melted butter and ¼ tsp salt. Set aside. 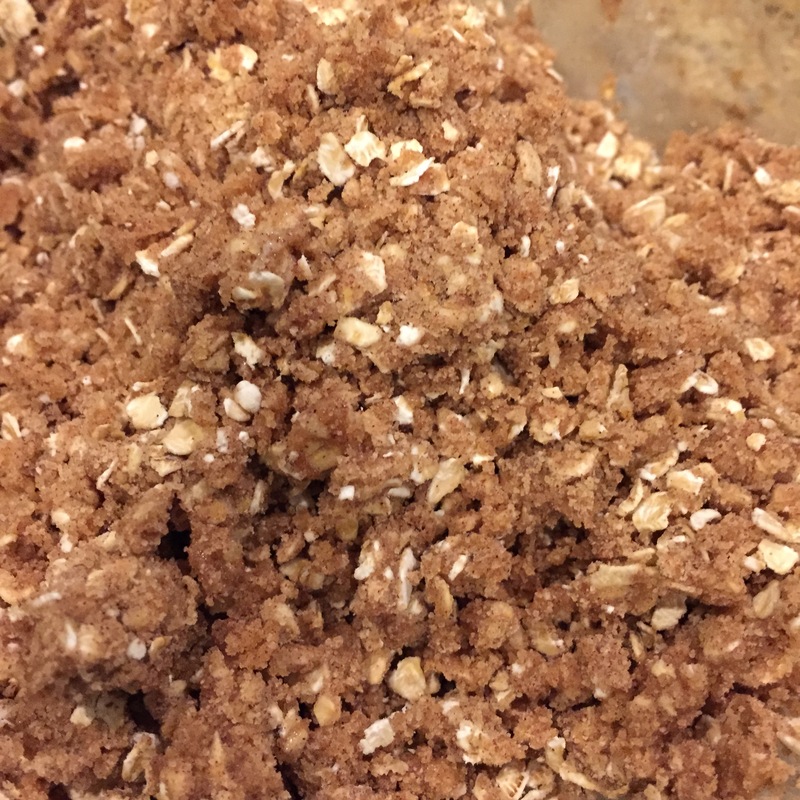 In a smaller bowl mix flour, brown sugar, oatmeal and remaining cinnamon. Add 4 tbsp softened butter and thoroughly mix using a fork or hands (I prefer hands). Flour tabletop and mini muffin tin. Using a rolling-pin, roll out crust until thin. 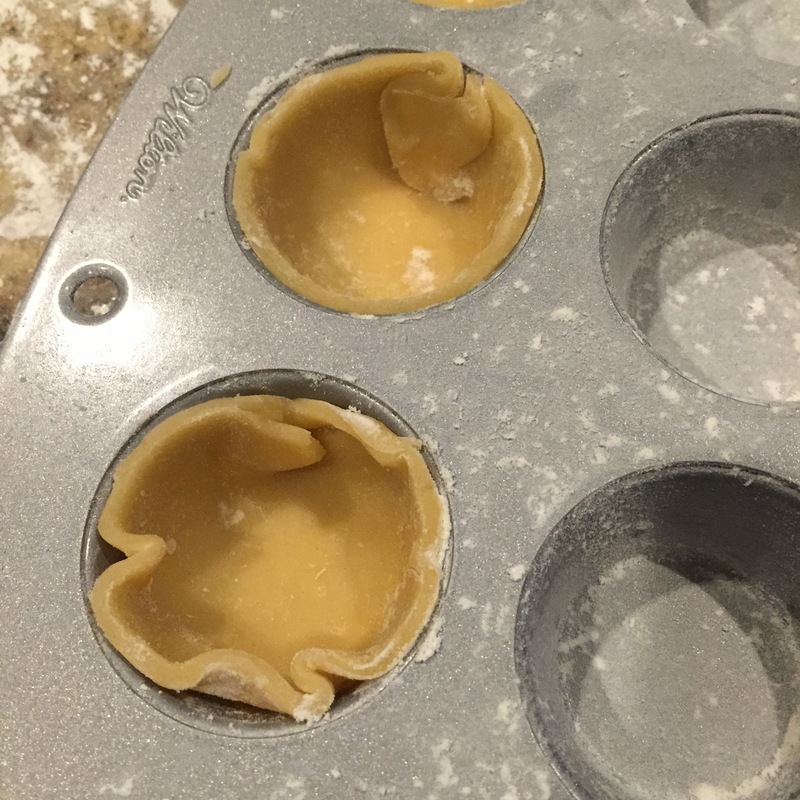 Using your round cookie cutter (2 1/2″-3″) cut circles and carefully place into muffin tin pods, crinkling edges as needed. 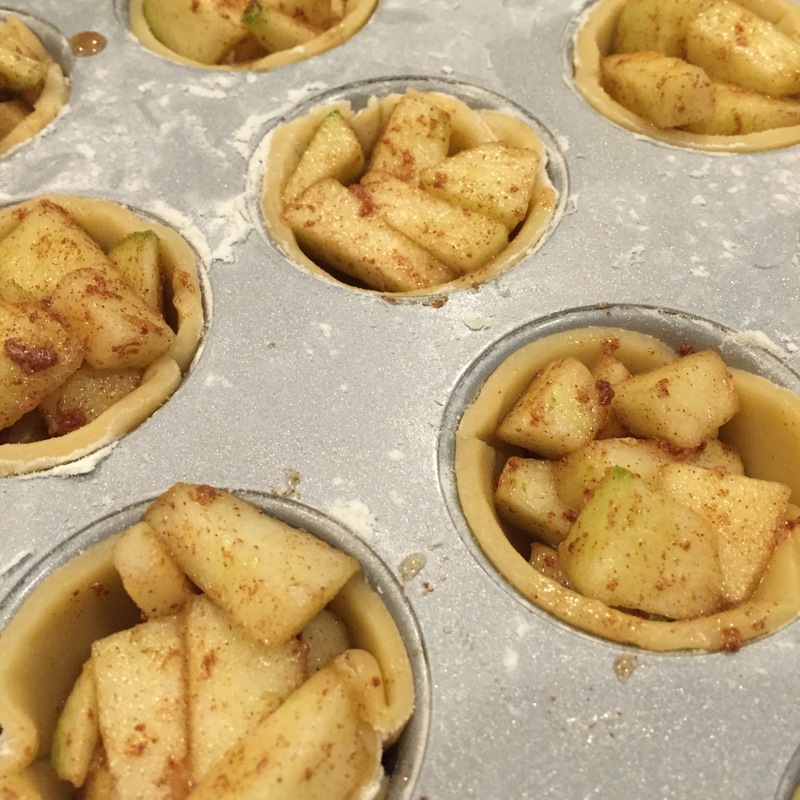 Spoon apples into each mini pie crust then top with the streusel. Bake at 325 for 23 minutes or until the edges of the crust are golden brown. Let cool about 10 minutes and use knife to help pop out. Enjoy!